Last night I had dinner with a friend, we ended up talking until the restaurant closed and they more or less threw us our (which really isn't that late, some restaurants really close early here). I had to pick up milk on my way back home - and I just love that I don't have to stress out, making to the store before closing. Safeway, where we usually shop, has open 24/7. It's pretty quiet and empty - but it's open. Actually it's just like they have the store open during restocking. Because all restocking takes place at night. During the day the store is in prefect order, every thing in place. When you go there over night, the aisles are filled with boxes and items and quiet store people with iPods working quickly to restock the shelves over night. It's like two different stores. I'm thankful for that they keep the store open. That way you can get milk even past 11 pm at night. Last weekend during our "Swedish alien weekend" in downtown San Francisco we stayed in a little bed&breakfast together - Belvedere House. It was the perfect hangout for us over the weekend. 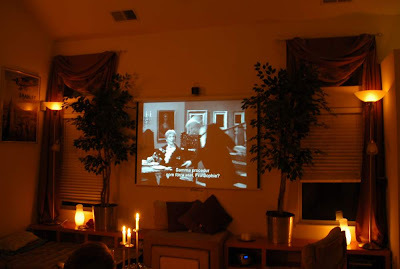 It really felt like staying in someone's home (a very special home, with a huge "personality"). Every morning we could gather around the big dining table having breakfast that you went to get in the kitchen - any time it suited us. Huge bathrooms, nice rooms and just a cool atmosphere. It's located in a really nice neighborhood, surrounded by tons of big trees and Victorian houses. You really feel you're staying in San Francisco. If you're looking for a special place to stay in when in San Francisco - this sure is it. And with the dollar exchange rate being low - yet another reason to come visit! 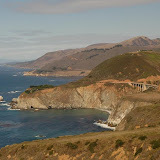 California sure is more than Disneyland and surfing. 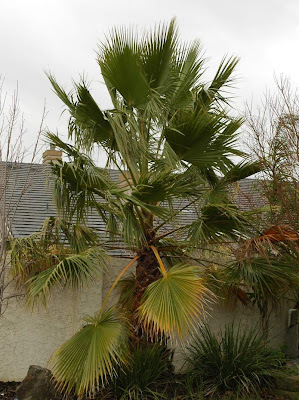 Even though we really don't have much rain in my part of California, you really get used to the sun. So in January, the rainiest month of the year, we really shouldn't complain, after all, soon we won't see clouds in months. But it's interesting how you can get used to the sun and warm weather. The Husband is just laughing, saying he will quote me when those 100F days arrives and I wish for clouds and rainy, cool weather. So, the Husband got us Blackberries. As in the phone/pda. Not the fruit. He has been hunting for something that would fulfill all his mobile needs and we've been through Palm Treos, Pocket PC Smartphones - and now we have Blackberries (and before that a bunch of different Nokias, still one of my favorite brands). He seems happy, and then so am I. I just make sure that what ever he installs on his, I install on mine and I should be good to go. The glory of having an in house geek. Having the same phone also makes things easier. Same chargers, same headsets etc. Makes it easier when leaving the house since these days you almost need an extra suitcase for all the cords and accessories to all the electrical stuff you can't live without. 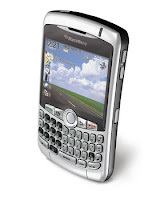 There is even a Facebook application for the Blackberry. So now don't even have to leave my friends behind when leaving the house. Great. I think? The rain has finally stopped. We're out exploring the city having tons of fun. Next stop Golden Gate ! Soon I'm beating the bad weather and hitting the road. 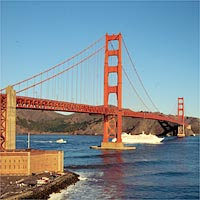 I'm off to San Francisco for the weekend, staying in a cute (hopefully, we haven't seen it yet...) bed&breakfast. For the first time I'm meeting Swedish friends from all over the US that I have talked, laughed - and cried with for the past four years. I "speak" to them every day, but I haven't actually met them. Yet. Now we have a full weekend to actually talk without a key board. And we have to try to remember to call each other our "real" names, and not our screen names. Even though I already have a nickname to my online name ("Jaccan"). It's going to be a lot of fun - I'm very excited! Too bad my friends, from Seattle, Portland and Toronto won't get to see any Californian sun in this horrible, rainy weather... Oh, well. I guess we just going to stay inside and drink cosmopolitans instead! Last year I flew 60646 miles. So I have now been given a United Airlines Premiere Executive/Star Alliance Gold card. Which basically is an indication that you have been flying way too much. The only advantage of having to fly between California and Sweden is that at least you get a lot of millage. The card will however make it easier to check in, go through security and hopefully it will render a couple of free upgrades to the front of the plane (because I'm still sitting back there squeezed in with the majority of the people). Being a communication nerd, I always find these "chain e-mails" that shows up in my inbox now and then very fascinating. Usually some friend has decided to forward them to their entire address book - accompanied by "Read this story - it's amazing/horrible/fun" or something like that. Maybe I'm not like most people since I usually never immediately forward them, but I always go online to search and read about the e-mail, it's origin and how long it has been circulating online. To this day - it has never happened that one of these e-mails I have checked have ever been true... They are always hoaxes - at least to some extent. They might still be amazing, horrible and fun - but not true. Urban myths in the e-mail world. 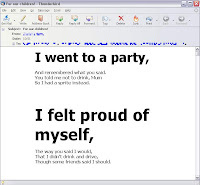 Today I got one that when checked had been circulating the e-mail world since 1999. The original sender claimed to be MADD - a very important organization in the US which fights drunk driving (Mothers Agains Drunk Driving). It claimed, as so many of these, to be collecting names to send to someone, somewhere. MADD had nothing to do with this e-mail, and even though they have said that they of course like initiatives that would try to eliminate drunk driving, sending this e-mail around might not really help or do much (and a lot of their valuable time has been spent answering questions about this e-mail). We were invited to new friends for dinner last night. It was such a nice, relaxed evening. Don't you just love meeting new friends to just... hang out with... completely relaxed... letting your guard down and just be yourself. I get a lot of questions on "how do you make new friends as an alien?". And I shouldn't really be a good person to ask. I'm really kind of shy, reserved and cautious. You wouldn't find me happily socializing through a room at a party, or chatting away with strangers I just met. But - moving to the US - and - social networking online really has changed me. One of the best things about the US is the openness and the social interaction here. (Even though some people claim that this, compared to other cultures, really is more shallow and in the end doesn't really mean anything - and I always disagree... and besides - I rather talk to people on the bus these days but sit quietly, staring out the window like in Sweden.) It forces you to practice doing small talk however hard you think it is. Social networking online really has boosted my self confidence and I now have a bunch of really good friends that I have hardly ever met IRL that I "talk" to every day, that makes me laugh, cry, learn and feel good (and isn't that what friendship is all about). And I've gotten more brave an open. Of course you might need a bit of luck to find friends whom you connect to beyond small talk. But you can definitely find and make new friends as an alien - you just have to practice and be open minded - however shy you are originally. Thanks A and P for a great afternoon and evening! Today I headed back for California from Reno, taking the I-80 over the Sierras. 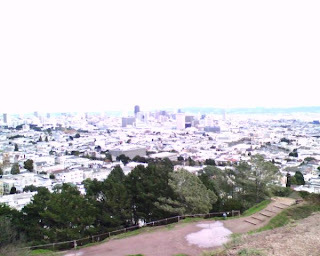 It's pretty amazing to go up over those heights. 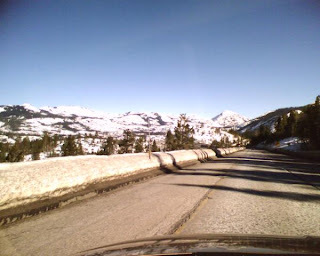 You pass by the Donner Pass, at about 7000 ft, or about 2000 meters. This part of the Sierras get an average of 10,7 m snow per year (415 inches), making it one of the snowiest places in the United States. The pass received its name a group of California-bound emigrants. 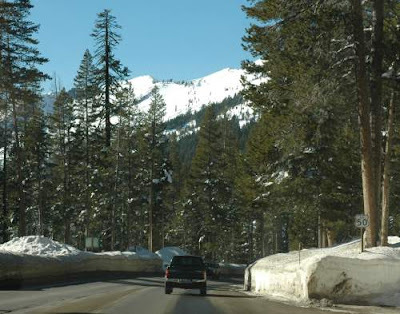 In November 1846, the Donner Party found their route over the Sierras blocked by snow at this place and was forced to spend the winter on the eastern side of the mountains. Of the 81 emigrants, only 45 survived to reach California (and it's said that some of them resorted to cannibalism to survive). This is a place you don't want your car to break down... It sure is easier these days to "head west". My trip back was pretty uneventful and I managed to beat the snow that was supposed to fall later today. I might have grown up in Sweden - but I still don't like driving in snow. Today I really got a first hand experience of the American presidential election. I got the opportunity to observe both a Republican and a Democratic caucus (procedure to elect presidential candidates). It was the first time Nevada had done the caucus and it had been lots of talk and speculation on how it would turn out (not only the election result in it self, but the procedure). It was a very interesting experience! We started out with a Republican caucus. 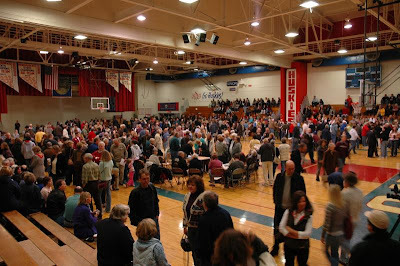 It was... complete chaos... 14 different precincts (valdistrikt) were negotiating in the sports hall of Reno High School... It was extremely noisy, and I'm surprised the participants could here the instructions. After about an hour they had all choosen their delegates and done their bid for their preferred presidential candidate however. I think. In the end of the day Clinton claimed the victory of the Nevada election with about 50% of the Democratic votes. Mitt Romney won the Republican vote. Who will be the presidential candidates in the end... well.. who knows... The race is sure on. Today was a really interesting day. I got the opportunity to visit both a Republican and a Democratic caucus (the election of presidential candidates) here in Nevada. Since today was an "EFTI" day as well, I just made a little slide show from today's events. So I'm in Reno to learn more about the American political process. This afternoon I got the opportunity to visit a political rally - Hillary Clinton's. She held her rally at the Sierra hotel here in Reno, in a huge conference/convention hall. She was very, very late - we waited for almost 1,5 hours. But it was really interesting. I tried to take some pictures, even though the lightning was really bad. I never got really close, I just couldn't wait standing in the front so long. I walked around taking in the scene, so by the time she finally came on, I was to far in the back to really get good pictures. There is no doubt Hillary Clinton sure is a experienced politician. She speaks in sound bites, knows what engages a crowd. It was really interesting to watch. I put together a little slide show from the rally. Tomorrow I'm going to attend two caucuses! Now THAT is really going to be interesting! Quick trip and dry roads. My new GPS in the car took me all the way to the hotel door! Perfect birthday gift! Now I'm off to a Clinton rally! We're here to learn about the election and tomorrow is election day here in Nevada! 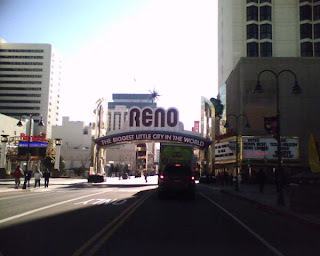 This weekend I will spend in Reno with my work mates. I'm driving and the weather is beautiful! You have to drive through the Sierras, over 7000 feet. Today was my birthday. And our engagement day. And actually the day when I found out I was expecting my first child. Big day in other words! Since my singleton years in Stockholm, with my family spread out over the world, I've always celebrated my birthdays a special way. I always take the day off and spend the whole day, celebrating myself, doing things I like, giving myself birthday gifts, visiting a spa, getting my hair done etc. I usually have a great time, and today was no exception! Here is a quick little slide show from my day! I had an appointment with my hairdresser today and I actually had cash to pay with. I usually never have cash, I'm so used to use my ATM-card (bankkort) or credit card. And since you pay a fee to cash money in an ATM-machine (bankomat) unless it's your bank's ATM-machine, you sort of keep from cashing money (unless you're at your bank) (where I, for the record, am way too often... like the other day for example...). Anyway - so when I was paying the hairdresser I had to add up the bills (and add the mandatory tip on top) and I realized it was a while since I payed that much money with bills. I almost had a hard time add them up. And it sure doesn't help that dollar bills are the same color. Different "founding fathers" (or whoever is printed on the bills) doesn't really make much difference. Men with beards all look the same. Well the hairdresser looked happy so I guess I did ok. I don't know what it is with this building, the city hall of Stockholm, but I've always thought it was one of the most beautiful buildings in Stockholm. It's strategic location right by the Lake Riddarfjärden in downtown Stockholm where you can see it from almost all angles. I just read that there is a new book about this building. A Chinese photographer, Yanan Li has taken the most amazing photos of this building, all collected in this book, "Det okända Stockholms stadshus" (The unknown city hall of Stockholm). 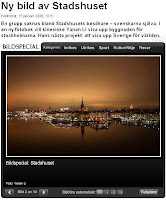 You can see some of the pictures on the Swedish newspaper Svenska Dagbladet's webpage - click here. The book will be published in English too (and Chinese if you prefer that). It's interesting that the book is published by a "Chinese alien in Stockholm". Maybe you see different things, new aspects, unseen angles, when you come from "outside". For a person from Stockholm, the building has always been there, you might see it every day, it becomes part of the... background through which you pass, living your every day life. Maybe it takes an "alien" to really see and explore. I really would like to read this book! There will be an exhibition of the photos in the city hall from this Thursday until February 14. Yes - I might actually make it - I'm in Stockholm that week of the exhibition- so maybe that will be my Valentine celebration - look at beautiful photos of my favorite building - in my favorite building! (since the Husband will be thousands of miles away anyway...). Today I had to run by the bank. I actually have to visit the bank office quite often here. 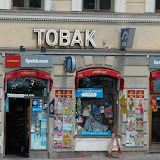 I don't think I visited a bank office at all during my last couple of years in Sweden, after getting internet banking. But this country still lives in the stone ages when it comes to banking, so even though I do have internet banking, I still need to visit the actual office. My bank, Washington Mutual, isn't too far (I could actually walk). 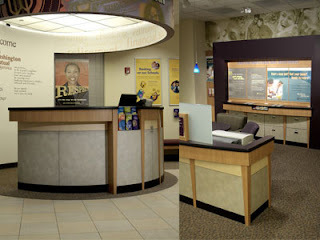 They have "the new look" of bank offices. Very informal. The clerks are standing up at small stands, and when you get help you more or less stand next to them. I never really got this part. Why do I have to stand closer to a bank clerk than for example the sales clerk at a Gap store? And what's wrong with a lite "dress code"- after all we're dealing with money, not... sports goods... And maybe I'm really getting older or why doe the bank clerks seem so young? Are they really out of high school? Last week's major storm over California sure dumped a lot of snow in the Sierras... Today we headed up the mountain for a day in the snow again. This "city" for example. 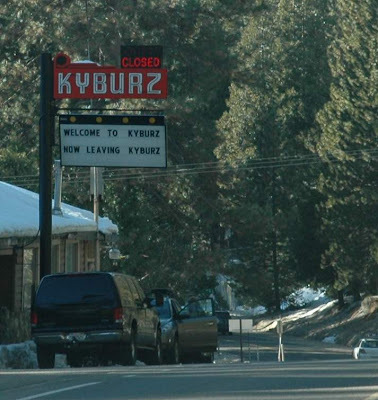 Kyburz on highway 50 between Sacramento and and South Lake Tahoe. Must be one of the smallest one I've ever driven through. I just absolutely love this sign. 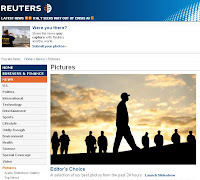 I'm experimenting with different ways to feed my status to my different "social websites". Not that I'm that sure anyone is really interested in knowing what I'm doing right now (except my mom), but it is still fun to learn new things. (And "Ja", that's me... Facebook thinks my first name is Ja and last name is Cal). Last night, while driving home from my "girls' night out", I was thinking, "it's really dark, I should watch out for something coming out on the road", when a coyote crossed the street right before my car. 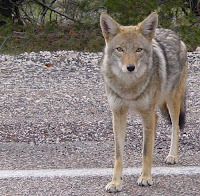 (Picture from Wikipedia, where you can read more about coyotes). One of the best things with my university exchange year here in the early 90s was that I "broke the English reading code". Sure, I could speak English when I came here for my university studies (after all, 9 years of compulsory English education made some things stick, and in combination of watching "un-dubbed"TV, I could make myself more or less understood), but reading literature fluently... naah. If getting a choice, I would always pick a book in Swedish. I took a lot of classes that exchange year, and sure, I still use some of the things I learned in class, but the best part of what I learned that year is my ability to read fluently in English. Well, fluently enough to be able to read a non-fiction book without getting lost or stuck. I still don't know every, every word, but I don't let that stress me, but keep on reading and in the end you can usually grasp it all. I just finished a wonderful book - The Memory Keeper's Daughter, by Kim Edwards. I was mesmerized and I could hardly put the book down. It raises a lot of questions and thoughts, especially when you have kids yourself. I really, really liked it. Tonight I took a little power walk around the neighborhood, and I had some stuff to get at the close by plaza. I thought I was ready when I left the house, but when I got to the plaza, I sort of needed a restroom. When you're married to a geek, you get a lot of fun gadgets for Christmas, birthdays and anniversaries. I never have to research what to get, install and implement. I have a living CIO in the house. Very practical. But now I have motion pictures well covered too! This is my new little gadget - a Xacti (Sanyo Xacti VPC-HD1a)! 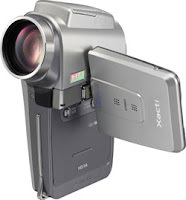 It has a 10x optical zoom and record both 720-pixel high-definition video and snap 5.1-megapixel digital still images. And it slips easily in my camera bag! 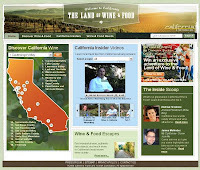 Hopefully now I will be able to take more moving pictures from California for the blog. How about a week in IKEA? A comedian in New York, whose apartment is getting fumigated, got IKEA to agree to let him stay in their store for a week. Mark Malkoff will be eating IKEA food, but will (thankfully?) take his showers in a back room. He is writing a blog (of course) - check it out here. We spent a lot of our Christmas holidays catching up on Swedish television online. We saw all episodes of Grotesco, a new comedy program. While the Husband was on the floor laughing (his kind of humor) I stayed in my seat, but did laugh a bit. Actually in "English" (and some "French" in the beginning)! Yesterday was my wedding anniversary. 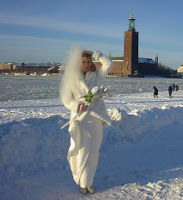 On January 5, in one of the coldest and snowiest Decembers in a long time in Stockholm, I got married. I wanted to take our wedding pictures in one of the most beautiful places in downtown Stockholm, the island Riddarholmen, with the view of Lake Riddarfjärden, the Stockholm City Hall (Stadshuset). I have spent so many hours sitting on the quay here, during different seasons. It's one of my favorite places in Stockholm. My wedding day, January 5, also known as "Trettondagsafton" (Eve of Epiphany, Twelfth night), was a fantastic day, blue sky, the snow and icy glittering in the sun. And freezing cold... -15C (5F). Without the wind factor. And it was windy. Gosh it was cold. But the happiness of the day and the event itself made it possible to stand there and have our pictures taken. After waking up to some sun this morning, in the break between round two and three in this major winter storm, the wind and the rain came pounding back at lunch time. We just managed to get out and clear the broken tiles, sweep up the scattered things around the back yard, and build an improvised support to the broken back fence, enough so it will make it through round three. We hope. We seem to be lucky though. At least we didn't get a three through our roof like a lot of people. And we were lucky not to loose our power, 150 000 customers around our city lost their power yesterday, 25000 still have no power. Ok. I take it back. The sound of wind and rain was NOT exciting. Only scary. 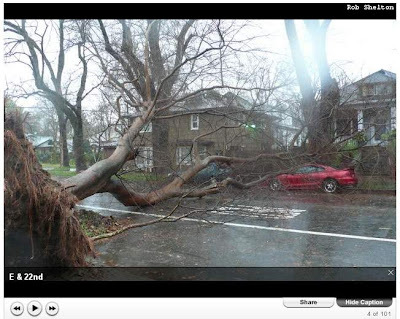 This was one of the worst storms I've been through here. I woke up at 5 am, thinking the whole roof was going to come off. It was sooo bad. When the tiles started flying off the roof and we lost a outside net window, it was not exciting in any way. Finally in the late afternoon, it calmed down. Phew. The house is still standing and all the trees in the garden are still there, even though they all have a more... rugged look to them. Oh, well... you can't have everything you wish for... I'm happy for all Danish people in Northern California. Congratulations! After a pretty rain free fall, we're getting our share of rain and wind the next couple of days. We will get three rounds of storms. The first round has already moved in. It moved our patio furniture around and disorganized the kids play yard. But round two will be the worst - it will come in tomorrow morning and continue through out the day. According to the meteorologists, "wind gusts might be powerful enough to knock down trees and cause power outages". Then we'll get a a break until round three comes in Saturday afternoon. And the meteorologists are really happy - finally some news! 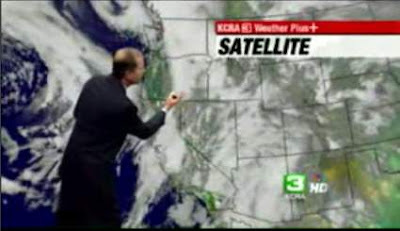 If you want to see an excited meteorologist from tonight's news - click here! Ok, friends and family back home in Sweden! 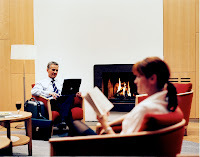 The dollar exchange rate hasn't been so low in ages, 2008 is going to be the perfect year to come visit us! Just get that ticket now! We had a great New Year's Eve with good friends visiting and good food. The only thing we missed was the fireworks... but to our big surprise, someone in our neighborhood broke the law and we saw one (1) firework at 00.05 last night! (Everyone should get the chance to celebrate a New Year's Eve in downtown Stockholm, getting the real New Year's feeling).